A claim of ignorance that is not credible and appears self serving. Usage: Eric Holder is Obama-Oblivious on the Fast & Furious scandal. 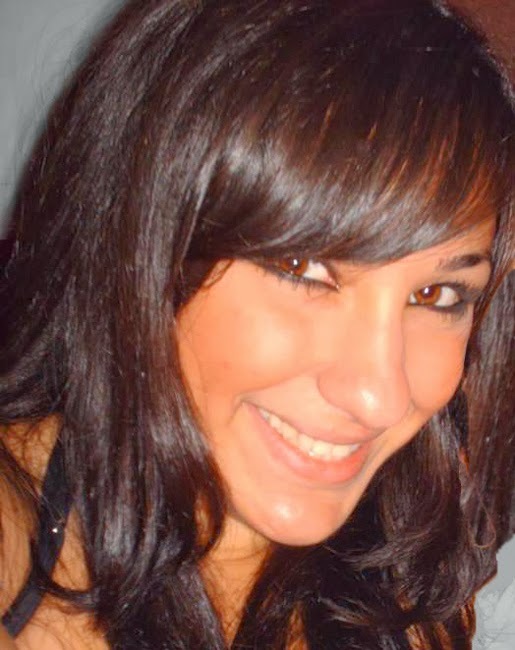 Sarah is a young, hard working, single Chaldean woman. During the last week she worked three double overtime shifts. This young Catholic woman lives at home with her family and her mother works for the school district. Sarah doesn't take handouts and she never received "free lunches" at school. She is very proud of her family's hard earned success and that of other members of the Chaldean community. She says comments from disgraced El Cajon Mayor, Mark Lewis, make him sound like "a hater." "Hater" is a synonym for jealous and resentful, in case you aren't familiar with the term. Chaldeans are Catholics from the Middle East, most are from Iraq. Of the 50,000 Chaldeans in San Diego County, between 10,000 and 12,000 live in El Cajon. They have lived in close-knit communities since Islam arose from the Saudi Arabian peninsula and conquered most of the Middle East. If not for their community focus and hard work, they would have been swept away by the forces of Islam long ago. Sarah is critical of Lewis' statements, "How does he know which kids are dropped off in Mercedes and which are getting free lunches? I never had a free lunch because my parents worked hard. Chaldeans live in different (financial) circumstances. Some have nice cars and some might be driving old Mercedes that they bought for $8000." In a statement released to U-T San Diego on Thursday night, Lewis said his decision to resign is primarily due to health reasons, including what he described as a minor stroke in 2010, cancer and a dislocated shoulder. “Unfortunately, at times, this has caused me some difficulties in clearly communicating my thoughts, including during the recent interviews that have caused understandable concern within our community and for which I have already apologized,” Lewis’ statement said. Sarah is concerned that widespread abuse of social services is being unfairly blamed on the small Chaldean community. Some of the community is comprised of penniless refugees who have just arrived. The refugees were professionals who could afford to flee. Doctors and engineers who need recertified to work in the U.S. and who need assistance and understanding. Other Chaldeans have been working in San Diego for decades. Sarah's family fled Iraq when Saddam Hussein came to power in 1979. She was born in La Mesa, California over a decade later. Her family has owned several businesses in San Diego County and they never turn down patronage from "single women." Apparently, Mark Lewis' "single women" comment confused Christian Chaldeans with fundamentalist Islam due to his stroke. Here is a helpful tip, look for beards. 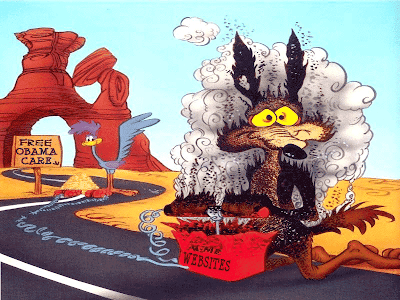 On Monday at 11:25am in the White House Rose Garden, President Obama is having a press conference on the embarrassing ACME ObamaCare website (HealthCare.gov). ObamaCare fines Americans who do not sign up on a website that does not work. This is the definition of unfair. The President will be forced to delay the ObamaCare mandate EXACTLY as the Republicans had asked for and President Obama denied in order to shutdown the government. Before President Obama is forced to delay the individual mandate and admit the Tea Party was right, he will claim that the technical "glitches" can be fixed. Expect a "best and brightest techies will fix it" statement. Massive additional tax monies will be wasted on the effort. Unfortunately for the President, failing, poorly envisioned, multi-million dollar centralized systems aren't "fixed" by more or better programmers. They die and are redesigned. Massive customer service centered technology innovations are the realm of the free market, not big government. Like education, no amount of money or big government will make the system work reasonably. But again, ObamaCare was never designed to work, it was designed to kill private insurance companies in order to force "single-payer" socialized medicine on Americans. So the President and the Senate shutdown the government for nothing. They screamed and cried that it was Bush's fault or the "tea party's" fault to conceal the truth, but truth is hard to kill. In the end, ObamaCare must be delayed. If it is not, it will drive millions of Americans into the arms of its tea party. 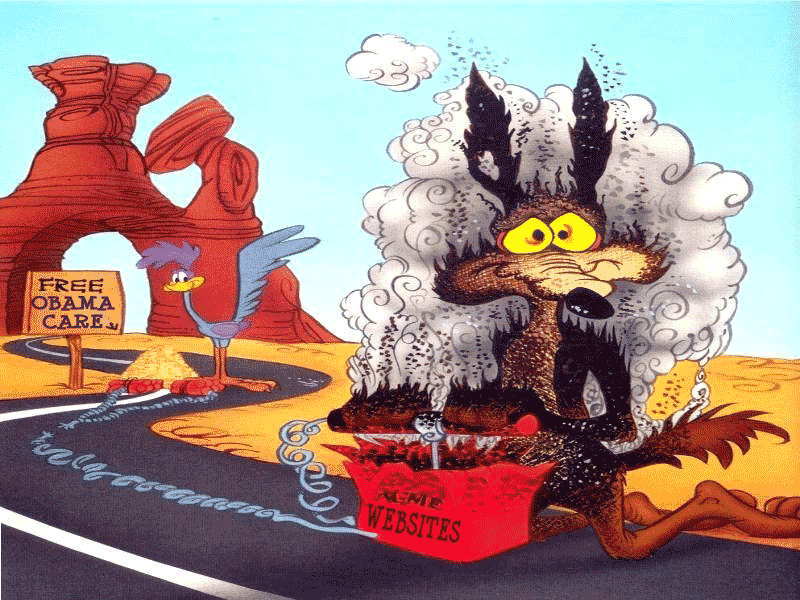 ...Or maybe the failed "ACME Healthcare" website is intended to take the blame for the system. Maybe this is all part of the "Single Payer" plan to provide a scapegoat for the administration when dealing with angry insurance companies. Blame "the website", the latest in a long line of "blame Bush" tactics. We understand your frustration at the repeated lies from the administration and their allies, both in the media and the Republican establishment. However, your concerns are unfounded. 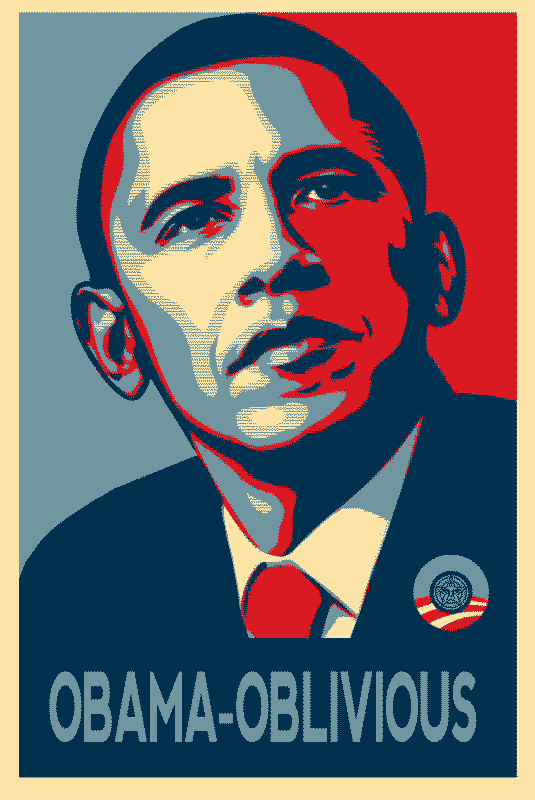 President Obama and the progressives may have won the battle, but they just lost the war. In June 1812 Napoleon’s army entered Russia, and the Russians fell back before him. Under pressure of public opinion, Alexander on August 9 appointed (Mikhail Illarionovich Golenishchev-Kutuzov) Kutuzov commander in chief of all the Russian forces and, on the following day, made him a prince. Napoleon sought a general engagement, but Kutuzov’s strategy was to wear down the French by incessant minor engagements while retreating and preserving his army. Mikhail Illarionovich Golenishchev-Kutuzov was brave, he had proven himself in battle, strongly believed in the Russian Orthodox Church, and he looked out for the troops’ well-being. The nobles and clergy also regarded Kutuzov highly. He had studied the American revolution, particularly how a people could lose every major battle and win the war. Kutuzov fought and lost a major battle at Borodino on September 7 which resulted in Napoleon taking Moscow. Napoleon accomplished his goal. In that day, taking the capital of a nation typically ended the war. Do you see where this is going? Don't we hear "Obama won the election" by the frantic leftists? Isn't the victimized president whining that everyone else is mean because he doesn't get what he wants? Napoleon thought he would win once he invaded Moscow and President Obama thinks he has won by implementing ObamaCare. In both cases, reality didn't match the plan. Napoleon scorched the earth during his march through Russia just as President Obama has used corruption, cheating and lies to pave his way to victory. Both of these arrogant strategies lack an exit strategy. Neither Napoleon nor Obama believed they would need an exit strategy. They expect opponents to surrender and allow them to revel in victory. Napoleon realized that he had NOT won peace and began his retreat in October, during the Russian winter. He faced constant battles as he tried to retreat to safety. His grand army was decimated just as the progressive movement is about to be decimated. ObamaCare and the debt are playing the roll of the Russian winter and the tea party is the swelling opposing army. We need only do two things to decimate the entire evil progressive movement. Block the Amnesty bill which they hope will distract us from the failure of ObamaCare and provide more voters who don't have skin in the game. Remember illegal aliens are exempted from ObamaCare penalties. Continue to fight at every turn, in every way imaginable to expose the heartless, cruel reality ObamaCare and growing debt. This is OUR country. America is NOT a socialist country. Socialism is Wrong and We Should Get Rid of It! Join the fight, on twitter, facebook, pinterest, reddit, or where you have an audience. www.theslobs.org is designed to help you find interesting articles and share them. We don't have to do anything extreme, just point at the truth with courage...and understand that the leftists trying to shame you into shutting up have no shame themselves. They are manipulating you because they know good, decent people are socialized to submit to shaming. It is a tactic developed by social psychologists who work for the progressives. Dianne, there is no reason to be upset. We are winning. The longer the government shutdown continues during the ObamaCare rollout the better. As Americans are impacted by the ObamaCare disaster they will be looking for help from those who oppose it. They will consider who told the truth about ObamaCare as they see the unnecessary suffering it is causing. Obama and the Democrats lied to America. The longer and stronger we stand against ObamaCare, the more credibility and support we gain. The progressive position is the opposite. The president has already forced one downgrade of America's Standard and Poor's credit rating on August 5th, 2011. The markets fell 634 points in a couple days. Standard and Poor's warned that raising the debt limit with no intention of paying it down was unacceptable. The House of Representatives is fighting against unconditional debt limit raises and the massive new ObamaCare entitlement. Republicans have the support of the financial markets and the public-at-large supports the defunding of the Unaffordable Care Act entitlement. The stock market goes up as the tea party rebels against the massive government spending. The stock market should rise today (10/16/2013) if the debt limit is NOT raised. 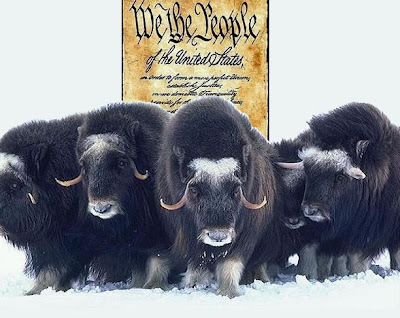 President Obama and other progressives are standing defiantly in the path of a buffalo stampede unable to see the consequences of their stubbornness. They expect their "perception is reality" spin in the media to save them. They expect to step aside as the stampeding heard runs off a media cliff. Unfortunately for them, REALITY EXISTS. Obama and Reid are responsible for the shutdown and the public is learning more about it every day. The false blaming of Congress only works in a short news cycle. No spin or twitter campaign will turn this disaster to their advantage. Pointing fingers and lying isn't a winning strategy here. President Obama is likely prepared to sacrifice himself to save ObamaCare, but his sacrifice would be for nothing. Big government is failing again. Progressive Democrats rely upon their top-down planning to provide solutions from the Ivory Tower. The ObamaCare plan is to usher in a crisis to be solved by government run single payer health care. 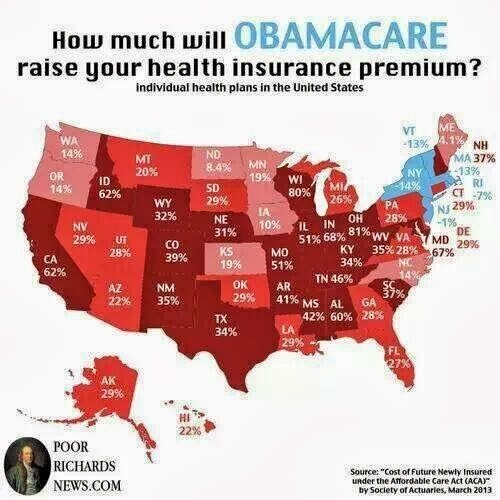 The "progressives" are prepared for ObamaCare to fail. They created the law to take out insurance companies and drive government dependence. They didn't consider the bravery and honesty of patriotic americans fighting to save our fellow citizens from this arrogant scheme. The President and his party should back down from a fight they can't win. They won't, so be prepared for more global-warming-style armageddon wolf cries. The media will also cry that the "tea party" can't win. They are wrong, at this point the tea party can't lose. The President cannot get his demands through the House of Representatives. Establishment Republicans will take ownership of ObamaCare and the debt if they tread on the tea party. This is a perfect situation for Republicans to stand firm on behalf of all Americans. Victory favors the bold. 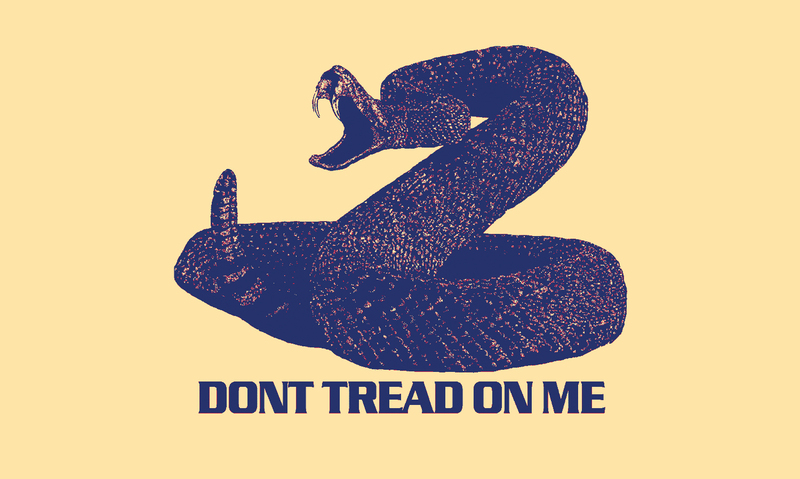 So boldly stand your ground and repeat..Don't Tread on Me! Despite what the apocalyptic press might say, the stock market is up during the government shutdown. Ironically, the White House has unleashed their "essential" government twitter workers to start a #EndThisNow hashtag. 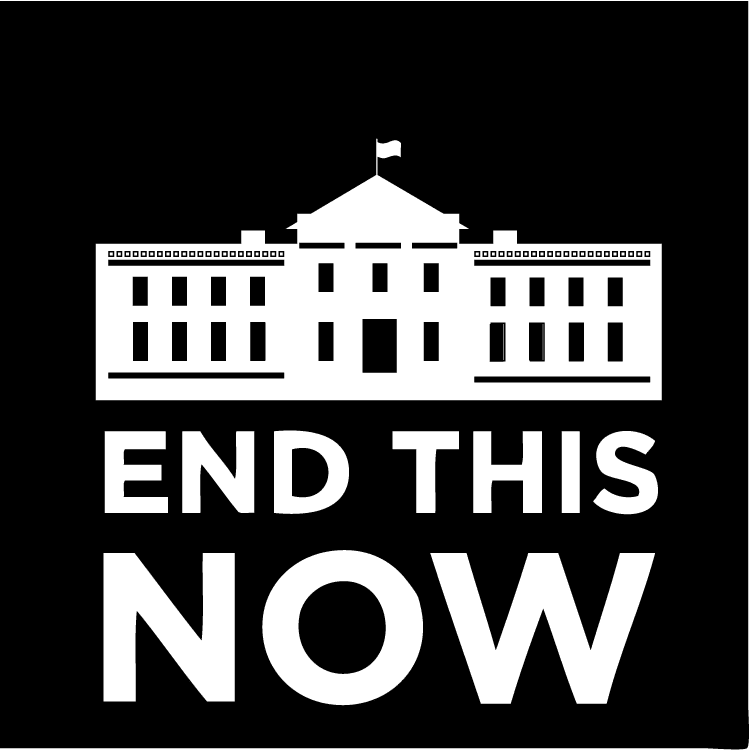 The leftist doomsday rhetoric is on full display along side President Obama's "essential" propaganda department logo. The House of Representatives must remember why they were elected. Rein in the spending, stop the debt and America will support you. It does take courage to stand up to the media and low information voters. So, show the world why this land is called the home of the brave. To show our support we have created a logo graphic to demand the White House to compromise and accept one of the 14 deals already offered by the House of Representatives. President Obama's approval rating has fallen into the thirty percent range as his lies are finally falling on deaf ears. Lets not go into President Obama ordering government workers to cause as much pain as possible on the American people, his "I will NOT negotiate" tantrums, or withholding death benefits from the families of fallen military members. Lets take a moment and acknowledge that the truth is winning on ObamaCare and Obama the man. After years of exposing the current administration's cold, callous and vindictive tendencies, the American people are finally benefiting from our hard work. They can take a honest look at the actions of our Kommander in Chief. This wouldn't be possible in the propaganda driven media environment without brave Americans who stand up for the truth. This is my "Thank You." A video which has nothing to do with politics, but exemplifies the moment Reality meets ObamaCare. car salesman... and so forth. really good, he will go home with some guy and stay with him all night for money." really true about your father?" in front of the other kids." Truth is the main target of progressive attacks. The leftists use slogans, lies, corruption and cheating to overcome and stay ahead of the truth. It is not an enviable position in the world of twitter. So it is our duty to watch them squirm as they try to convince the world that the Senate and President Obama haven't caused the #ObamaShutdown to defend ObamaCare. Crazier still is their argument that Republicans refuse to pass a budget, when ONLY Republicans have passed a budget since 2009. Despite it being required by law, Democrats refuse to pass a budget. This #ObamaShutDown is just another example of progressive lawlessness. It is a matter of fact, not opinion, that President Obama has unilaterally amended ObamaCare to exclude Congress, provide waivers for his cronies and illegal aliens are exempt from fines. The Unaffordable Care Act known, commonly as ObamaCare, has been amended and delayed 19 times. 92% of Americans oppose Congress being exempted, one of the unilateral and unconstitutional changes to the law decreed by President Obama. Yet, a one year delay and/or forcing Congress to live by their own law as proposed by Republicans in the House of Representatives is the legal amendment that the President cannot abide. Obama negotiates with Al Qaeda and dictators using poison gas, but not the elected representatives of the American people?!? In @nprnews interview airing today, Pres Obama says he won't negotiate on keeping the Government open or on raising the Debt Limit. 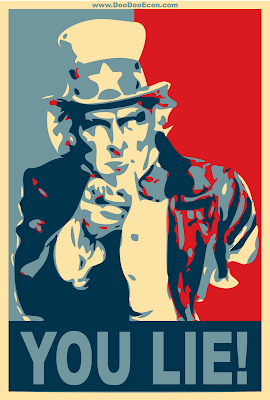 Well, lets do the one thing that the left cannot, tell the truth. 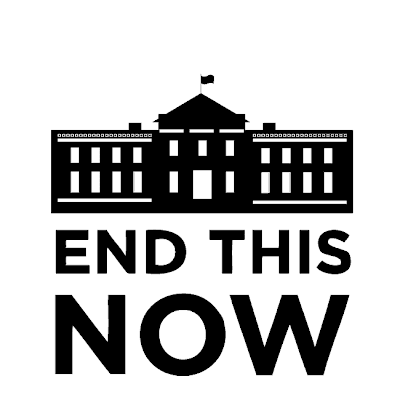 Go to twitter and use the hashtag #ObamaShutdown. Make it trend. Exhaust all of their meds! After using #ObamaShutdown, the progressive think tanks launched #GOPShutdown in response. Their astroturf effort quickly faded away, but they will have nightmares if we trend with real people. Bloggers will post, MSNBC will whine and their efforts to lie to the American people will be upended. It is time to flex a little social media muscle! #GovtShutdown isn't accurate! Everyone in Congress, the House #GOP, #Teaparty #tcot make #obamaShutdown trend and the left will freak out! Here is a sample of the insanity you will run into, but just remember, "that means you are winning." 1) As additional evidence that this government shutdown is being misrepresented, fellow SLOBs blogger W.C. Varones shows us that the stock market is up today in What if they Thew a Shutdown and No One Cared? 2) On ObamaCare, we all know it is a scheme to destroy insurance and force everyone into Single Payer government controlled health care. Allow me to remind you that during this process, 50 million Americans will lose their employer sponsored health insurance. Americans will suffer illness, injury and disease without the coverage they otherwise would have had if not for the ObamaCare scheme. If they succeed with this Single Payer scheme, quality of care will suffer, death panels will be empowered, and incentives for cures will be distorted by politics and bureaucracy. Ultimately, America will lose its leadership role in curing disease. If another country does not step-up, humanity faces a world where disease outpaces medical innovation. Example, we are down to one antibiotic to fight MRSA. Fighting ObamaCare isn't about politics, it is about lives. The progressives, in this #ObamaShutdown, have proven that they are concerned with politics not people. Help us in this fight for our lives.